Italy's populist de facto leader Matteo Salvini seems set on shaking Europe's financial establishment to the core. One day after the Italian deputy prime minister and leader of the League party, called for the elimination of Italy's central bank and the country's financial regulator, Consob, saying the two institutions should be "reduced to zero, more than changing one or two people, reduced to zero", or in other words eliminated, and that “fraudsters” who inflicted losses on Italian savers should "end up in prison for a long time", Salvini prompted fresh shocked gasps in Brussels and Frankfurt when he raised the possibility of seizing Italy’s massive gold reserves away from the country’s central bank. "The gold is the property of the Italian people, not of anyone else," Salvini said in comments to reporters on Monday, according to the FT. The controversial comments, which were seen as threatening the "independence" of the Italian central bank, whose one-time head was none other than Mario Draghi, prompted Giovanni Tria, Italy's economy minister, to defend the independence of the central bank. Earlier in the day, Italy's populists called on lawmakers to pass legislation stating that its gold holdings belong to the state, Bloomberg reported. So why is Salvini seeking to seize the gold and use it "on behalf of the Italian people"? While there was no clear cut answer, the Italian media reported that the coalition government of Salvini’s anti-migration League and the anti-establishment Five Star Movement, may be considering using part of the central bank’s gold to fund their spending plans. 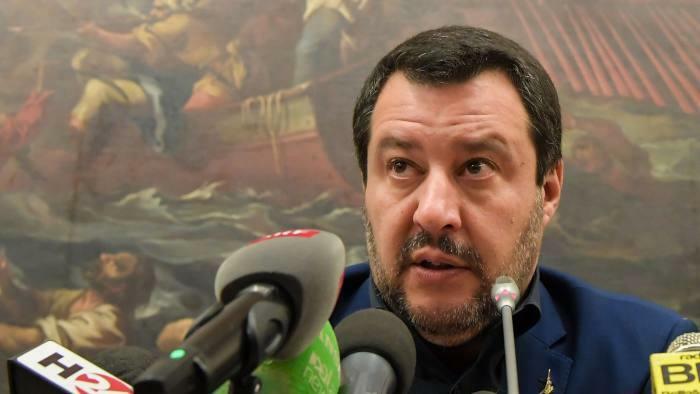 Salvini countered that while he had not studied the notion of selling Bank of Italy reserves to fund additional government spending in detail, he conceded that "it may be an interesting idea." If Salvini is indeed serious to monetize its gold, it would bring in a healthy chunk of change for Italy's populist leadership: the Bank of Italy has the third-largest central bank holding of gold reserves in the world after the US and Germany, owning 2,452 tonnes according to the World Gold Council, which at today's prices would amount to just over $103 billion. Of course, even that amount pales in comparison with Italy's total debt load of €2.35 trillion, which would suggest that if Salvini is indeed focused on tearing up the legacy constraints of his country with some financial establishment, the next step would be declaring the country's sovereign debt "odious" or null and void, followed ultimately by the Italeave, and the the return of the Italian lira.